Linak’s electric actuator is a compact maintenance-free unit for on/off operations with a speed of 7-11 mm/sec. It is available as standard in a 24 V DC version but it can also work on 230 V AC or 120 V AC if it is supplied with a control unit or transformer. The actuator unit features a solid stainless steel structure holding the actuator in exactly the correct position during operation. 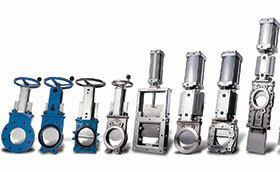 It can be supplied on Stafsjö’s WB11, WB14, WB14E and MV knife gate valves from DN 50 (2”) up to DN 300 (12”). The Linak actuator can be supplied with three different control units or transformers, all three can either be operated manually on the unit or remote operated via a cable of which two are available with push buttons for open/stop/close. An external battery backup WCU-UPS can be connected to the WCU to ensure the valve unit is fully operational in case of a power failure.